Manchester City Hall is located at 208 East Main Street, Manchester, IA 52057; phone: 563-927-3636. Photo: J.J. Hoag House (The Wheat House), ca. 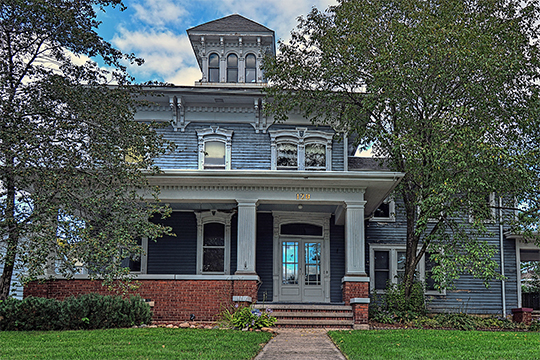 1864, 120 East Union Street, Manchester, IA. Listed on the National Register of Historic Places in 1976. Photographed by User:Kevin Schuchmann (own work), 2014, [cc-by-3.0 (creativecommons.org/licenses/by/3.0)], via Wikimedia Commons, accessed March, 2016. Manchester was incorporated in the spring of 1866, thirty years after the first permanent settler arrived in what is now Delaware County. Pioneer settler Robert Hutson located a home site a few miles north of Manchester in 1836, near the present junction of Iowa Routes 13 and 3. Four years later, Delaware County was organized with a population of 168 persons. The county seat was initially set in Delhi, approximately 6 miles southeast of the future site of Manchester, and county population grew to 1,759 over the next 10 years. In 1850, Steiner Eiversen purchased the first plot of land in what is now Manchester, a few hundred acres of land near Manchester's current Main Street. Five years later, a Mr. Burrington officially platted the community and named it for himself (the name was later changed from Burrington to Manchester). Burrington, in cooperation with the founder of Dyersville, began promoting the Manchester area as the route for the proposed Dubuque and Pacific Railroad. The team was successful in their campaign, cementing the deal by negotiating a payment of $13,000 to the railroad company for additional construction costs associated with the Burrington route. A post office was established in Burrington in 1856, and was referred to as "Manchester" to avoid confusion with Burlington, Iowa. Two years later, the community was renamed Manchester to eliminate the inherent confusion in this arrangement. In 1859 the Dubuque and Pacific Railroad tracks were extended to Manchester, followed closely behind by an extension through Manchester to Independence, Iowa. The combination of the railroad connection and the post-Civil War agricultural boom ensured Manchester's rapid development in the following years. By 1869, Manchester had begun to compete with Delhi for relocation of the county seat, arguing that the seat should be located in the county's most prosperous city. After an 11 year battle, Manchester was named the new county seat in 1880. Throughout its development, Manchester served as a supply center for rural residents in the surrounding area, and a shipping center for agricultural produce. When the agricultural economy began to change in the mid 20th century, the community began efforts to adapt its economic base to keep pace with modern economic development, an objective which continues today. RDG Planning & Design, Comprehensive Plan for the City of Manchester, 2012, www.manchester-ia.org, accessed March, 2016.